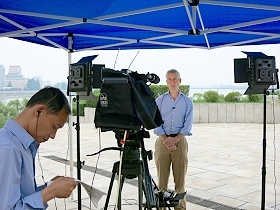 Pyongyang, Beijing and Havana: AP opens new live broadcast transmission facilities. London, August 2015: The Associated Press is expanding its Global Media Services (GMS) business, opening a new facility in North Korea and upgrading its existing live facilities in Cuba and China. AP GMS provides global broadcasters with on-the-ground broadcast facilities, producers, reporters and technicians whenever and wherever news breaks. Supported by a worldwide fixed infrastructure with satellite and fiber links, it provides connectivity around the world. AP GMS has operated in North Korea since 2002, but can now for the first time offer a dedicated HD live position to its customers. The new plug-and-play facility on the terrace of the Yangakkdo International Hotel provides a panoramic view of Pyongyang’s skyline dominated by the Tower of the Juche Idea. In Havana, ahead of key global events, including the opening of the U.S. Embassy and the visit of Pope Francis in September, there are now four HD paths available to broadcasters, meeting the increased demand for access to the region. 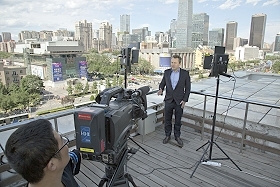 An office move in China, to join the main AP bureau, means AP GMS can now offer broadcast customers a stunning new backdrop of central Beijing from the 12th floor podium terrace, as well as new indoor studio facilities. “The developments are in response to trends and developments in the market,” said Andy Braddel, director of AP Global Media Services. “The thaw in U.S.-Cuba relations means more broadcasters are now getting the opportunity to go into the country and there will be a steady stream of stories emerging from Cuba.